It's the news that all metal-loving drummers have been waiting for - Mike Portnoy is to tour with Avenged Sevenfold. The Dream Theater sticksman fuelled speculation that he'd be at the drum stool for the band's next worldwide jaunt by getting behind the kit to record their as-yet-untitled new album. Portnoy has now revealed that he will tour with A7X for as long as his schedule permits. He said: "After having had such an amazing experience recording my drum tracks for the new Avenged Sevenfold album, we all knew it would be awesome if I'd be able to do some touring with the band after its release. "Although I wish I could stay on board with Avenged Sevenfold in a more permanent capacity, the reality is that I am committed to Dream Theater as my main priority (that is my baby after all!) and I will need to resume work with them to start a new album at some point in 2011. "However, I will be able to join my brothers in Avenged Sevenfold for at least the duration of their touring throughout 2010 and hopefully this will give them the time to continue to heal and get comfortable back on the road." Portnoy stepped in to help the band after the unexpected passing of drummer Jimmy 'The Rev' Sullivan last December. 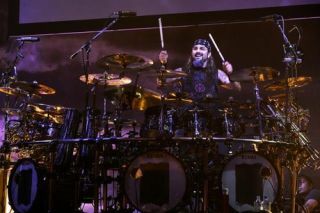 Back in Rhythm 175, the Dream Theater man said that he would stay faithful to The Rev's drum parts while recording the album.